On Monday my Op-Ed was published in the Los Angeles Times! In the last several months I have had the pleasure of working with editors at some pretty brag-worthy publications, though with the LA Times I can’t help but devote an entire blog post to my bragging. Shameless, I know. 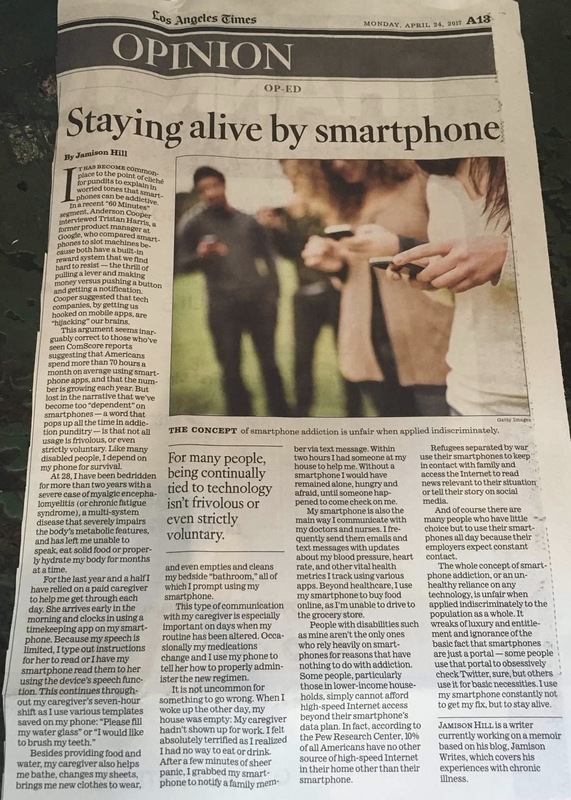 For those who missed it, my Op-Ed was about the unfairness of applying the idea of smartphone addiction to people who rely on the technology for their livelihood, or in my case, survival. The truth is, my needs would not be met without my smartphone. I do not dispute that some people, myself included, use their smartphone way too much. But I don’t have a choice. It’s either use it or not have my needs met. Hmm. Yeah, not a tough choice. Who knew they still printed newspapers? I almost forgot what they looked like. – How come I don’t use a laptop to avoid exposure to radiation? My smartphone is the only device my body can handle. I have one of the lightest and smallest smartphones, but it is still a burden on my senses. I keep the screen dimmed and on greyscale mode with the colors inverted to reduce the strain on my cognitive and ocular functions. Not to mention a laptop, or even iPad, is too heavy for my ailing muscles. So for now, my smartphone suits my needs. And yes, any writing I do — whether in a published article or a social media post — is done on my smartphone. – What apps do I use to interact with my caregivers? I use an app called Time Station for iPhone to log my caregivers’ hours. I use Notes and iMessage to write and send messages. And in Settings on the iPhone I have turned on the Speech function so the words I type are spoken out loud. I also use a dozen or so other apps, but they would take way too long to list. Oh, but I also use the Moment app to track my smartphone usage, which on days I’m feeling well enough, usually averages about seven hours. I think there were some other questions I received, but my mind is going blank at the moment (#BlameItOnTheBrainFog). Anyway. Thank you for entertaining my bragging and thank you to everyone who read the piece, as well as my other blog posts and published articles. Lastly, I just want to express my gratitude for the wonder of life and the experiences I’ve had thus far, including my recovery in the last year. My life, especially in the last decade, has been unimaginably difficult, but I am so incredibly thankful that I have made it this far. There have been so many times when I easily could have opted-out of this life and the immense struggle it has been, but if I had, well, I never would have seen my name printed in the LA Times. And that, among other things, is worth the misery I’ve endured. I hope it keeps getting better for me and that I can continue to share my journey with the lovely people, like yourself, who read this blog. On that note, please subscribe for more posts. I promise not to brag too much. What an accomplishment- congrats and brag away! I think it’s great you were published in the times! Congrats! Hi Francie, Oh interesting. A blue filter helps? I know red sometimes helps me. Congratulations Jamison!!! My life is in my smartphone too, its my window to the world. Thanks Chrissie. I’m glad I’m not the only one. I don’t even know how to use the camera properly on mine, and it’s an old model. But I’m fine sitting at my laptop attached to a big monitor – and you’re not. I’m so sorry – it must be hard to live on such a tiny screen, even if it’s all you can manage. La Times – congratulations, writer. Hey thanks. It definitely has pros and cons. I’m just grateful I can use my phone. This hasn’t always been the case. What they don’t understand about us ME/CFS types is that we’re doing everything we can – as you are – against tremendous odds. Keep it up. Congratulations on having your op-ed published in the LA Times! It’s a very well written article and a poignant description of how compromised life is for a person with severe ME/CFS (or any disabling illness). Thank you for sharing your story. Thanks! Glad I could shed some light on it.